For graduate and undergraduate courses in marketing management. 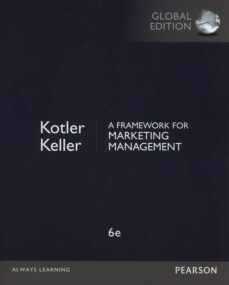 A Succinct Guide to 21st Century Marketing Management Framework for Marketing Management is a concise, streamlined version of Kotler and Keller's fifteenth edition of Marketing Management, a comprehensive look at marketing strategy. The book's efficient coverage of current marketing management practices makes for a short yet thorough text that provides the perfect supplement for incorporated simulations, projects, and cases. The Sixth Edition approaches the topic of marketing from a current standpoint, focusing its information and strategy on the realities of 21st century marketing. Individuals, groups, and companies alike can modernize their marketing strategies to comply with 21st century standards by engaging in this succinct yet comprehensive text.